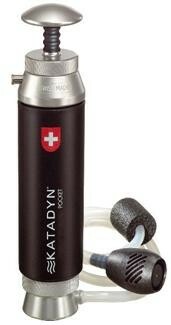 The Katadyn water filters are known to be the best made. They have been manufactured in Switzerland for over half a century. Their system is based on microfiltration through a 0.2 micron microporous ceramic filter element. All harmful cocci, bacteria, protozoa, fungi, cysts and parasites are totally removed, including the chemically resistant infectious agents of Giardia, the amoebic and shigella dysenteries, and those causing typhoid, cholera bilharzia and a long list of other dangerous diseases. No chemicals are used in the purification process. The effectiveness of microfiltration does NOT depend on uncontrollable variables such as temperature and acidity of the water, or on the type and quantity of dissolved or suspended mineral or organic matter. Nor is there any question of how much chemical to use, how long a contact time you need, how long and how vigorously you must stir the water to make it safe, or whether the chemicals have lost potency with time or exposure to heat or moisture. 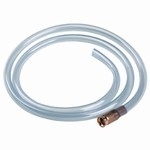 See new item # 2010K for current description. Model 1151 is the same as 2010K except for the external markings.